Aether Raids def team but im dying? I made a fun team that consists of 6 blue fliers, but with your average everyday rally trap to mettle it down a bit, so how do i make this gaggle useful so i can seem interesting? This is the Fun Gang, all blue. That’s the fun part. *Monocolor defense teams as a whole are usually a bad idea. 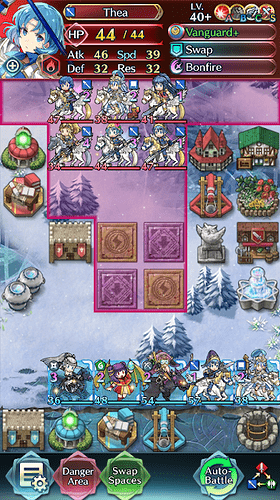 When I see a monocolor team during an AA run, I will run the color with the advantage. People will run varied colors in AR offense, and if they see one color throughout, they will take advantage of it. I do commend you for trying it out–and testing it. *Consider improving your def fortress. Level 3 is not very good for a T20. Mine’s level 4 (not including bonus) and I’m T19. Literally all I would do is throw Surtr into range and have him destroy all of them. You should add an Est to prevent stuff like that. Yeah the danger is characters who slow down special charges via Special Fighter/Guard/SS4 or who can’t be followed up on, like Myrrh. Running Est can help take down Armors. Myrrh is a different story though and I’m not sure that this team can have any hope of killing her at all due to her follow-up denial.